WOW Air: TLV-NYC for $149 one way! All these cute, hypothetical workarounds don't necessarily translate into reality once randomly stopped. Whether they choose to stop you is up to luck and moods, and if they do chances are you aren't getting out of it. And you aren't really one to argue with that as till now you weren't even aware that there are airlines and airports where baggage is weighed and sized at the gate. They are witches because they are rightfully enforcing a company policy that you agreed to and are now trying to sneak out of? While I usually appreciate your sarcastic, confrontational approach and your conviction that your opinions are far superior to others opinions and or actual experiences, I don't appreciate being called a liar. The stories I wrote about, are actual real life experiences that happend to me בדידי הוה עובדה. Regarding the witches comment: I won't call someone a witch for enforcing a company policy but for the way and tone they enforce it with. There is a big difference between telling someone politely that they must pay for an overweight bag and yelling at them that if they don't pay this very second they will be thrown off the plane and not put on another flight. The boarding agent alluded to was of the latter variety. Didn't see this posted yet- child tickets (2-11) are cheaper than adults. Starting at about $126.50 per way. I beg to differ. If they catch you at boarding, you can always wear your clothing, put stuff in duty free bags, put stuff in your pockets, etc'. I have easily gotten away with 30 and 40 pounds of luggage as "carry-on stuff". I've gone on planes where I have an official carry on backpack on my back, another carry on bag in my right hand hidden by the huge coat draped over my arm and concealing it, another carry on in my left hand concealed in a huge duty free bag, another duty free bag with my extra stuff and also a bag of food for the flight which they don't give you trouble about. Ah, I forgot to mention that I pressed my suit bag to my back and than put an overcoat on top of it, therefore holding the suit bag in place and concealing it. What about the hanger sticking out of my overcoat at the back of my head? That's where the neck pillow comes in and nicely conceals the hanger. And yes, I did all this with ULCC that are dying to make an extra buck off luggage. Not trying to get involved in your argument, but honestly I would hope you are writing hypothetical stories. I would be ashamed to do some of these things. I don't recall calling you a liar although feel free to let your conscience drag you in any direction it feels. Not to get off topic from y'all's luggage arguments but does anyone know what WOW's Biz is like? Maybe comparable to a normal Premium Economy? I was looking from Chicago for the Chagim and the prices are worse than flying a regular airline (can still get for $6-800 from there...(yes, Chicago is the best b/c is has all the same flights to Europe, IST and even Royal Jordanian that keep prices down without all the people fighting for TLV flights) BUT for about $1200 for what would be equivalent of an normal Premium economy seat, with all the luggage included and free cancellation, that seems like a good deal. Cart balance error. Your booking has failed. Please contact customer service. As others have mentioned, most of that is not creativity, it's just stealing. what about a Lap Child? Every battle is won before it's ever fought. Think about it. -Me. Ah, I forgot to mention that I pressed my suit bag to my back and than put an overcoat on top of it, therefore holding the suit bag in place and concealing it. What about the hanger sticking out of my overcoat at the back of my head? That's where the neck pillow comes in and nicely conceals the hanger. 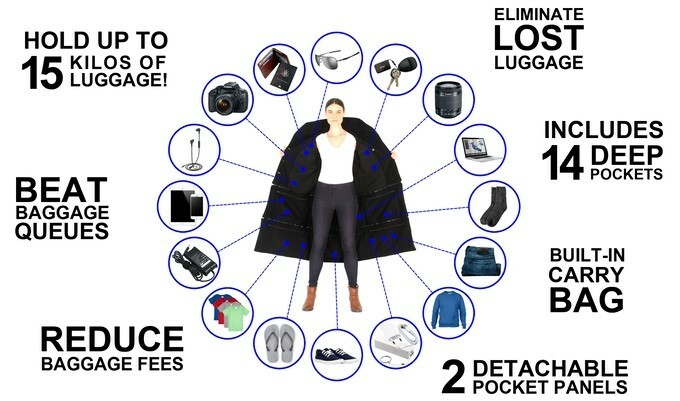 And yes, I did all this with ULCC that are dying to make an extra buck off luggage. And I thought I looked funny boarding with my talis and tefillin, covered with an overcoat, with a hat pulled down to my eyes! anyplace to hide the infant also?